Hardy Evergreen Bamboo | Henry Field's Seed & Nursery Co. 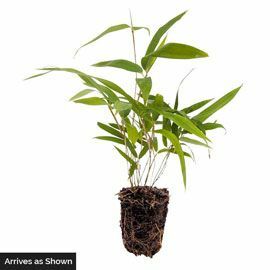 Shipping for Hardy Evergreen Bamboo was delayed. We expect this hardy variety to be ready to ship by mid-to-late May. Want to know immediately when it's available? Just sign up for an email using the Notify When Available button. 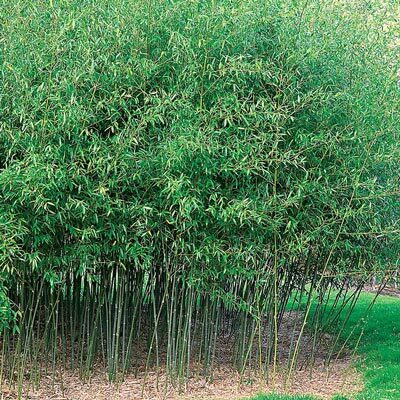 This attractive bamboo has dark emerald canes that hold their color even in the harshest winters. The dense, dark green foliage on erect 18-to 30-ft. stems makes it an excellent choice for privacy hedges. Grows well in full sun to partial shade, putting out new rusty-red-colored growth in the spring. Potted plants. Zones 5-9. Height 18 - 30 feet (colder regions will only reach approximately 18 feet. Canes can be up to 2 inches in diameter. Height: 18 - 30 feet (colder regions will only reach approximately 18 feet. Canes can be up to 2 inches in diameter. Depth: Plant at the same depth as in the pot. Where marginally hardy, plant in an area protected from Winter winds. Foliage: Green foliage and canes. Soil Requirements: Fertile, humus rich, well-drained soil. Pruning: Remove culms (stalks) to control growth into unwanted areas.